Please note that the content of this book primarily consists of articles available from Wikipedia or other free sources online. 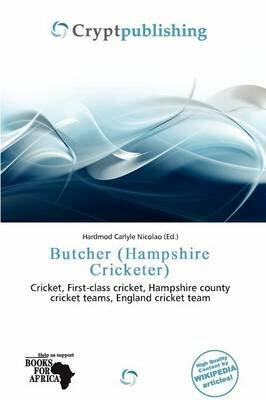 Butcher (full name and dates of birth and death unknown) was an English cricketer. Butcher made a single first-class appearance for pre-county club Hampshire in 1842, against an early England team. Cricket is a bat-and-ball game played between two teams of 11 players on a field, at the centre of which is a rectangular 22-yard long pitch. One team bats, trying to score as many runs as possible while the other team bowls and fields, trying to dismiss the batsmen and thus limit the runs scored by the batting team. A run is scored by the striking batsman hitting the ball with his bat, running to the opposite end of the pitch and touching the crease there without being dismissed. The teams switch between batting and fielding at the end of an innings.